New inmate Billy Wallace meets established inmate Dagger in the mess. Billy asks Dagger about his Batman tattoo, so Dagger tells his tale. He was a collections enforcer on the “outside,” until Batman nabbed him. Dagger was quickly sentenced to 3 to 5 years in Stonegate. While in transit to Stonegate, he and another inmate (“Pit Bull”), manage to escape. In the ensuing chaos, Pitbull fires a stolen gun a few too many times, making the pair easy to find. Batman appears and easily subdues them both. As the tale ends, Billy assumes the tattoo is to remind Dagger of vengeance. 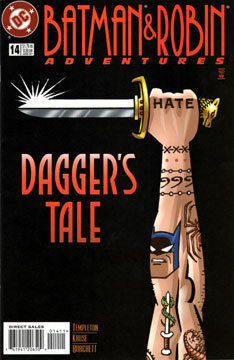 But Dagger corrects him; the tattoo is to remind him of humility. There’s always someone a little stronger, a little tougher, than you are. There’s always a Batman. Short but sweet, as they say. A nice little character piece that didn’t involve a major Arkham rogue. Makes for a nice change of pace. Excellent. No problems. All the artists involved make reading about non-costumed criminals pretty intriguing to look at. Not this time. Unless you dig Batman tattoos.